The principal of an award-winning interiors practice, Wanda S. Horton knows the key to keeping interiors fresh is by bringing forth historical, classic elements, while being mindful of which trends should be incorporated or left behind. A leading designer, she understands the importance of living in a home which greets you with comfort, function, well-executed design and all of the special details to reflect who you are – all the while addressing your lifestyle, preferences and needs. Wanda is a master at creating timeless, quality interiors that span not only across generations, but design styles, as well. She has an uncanny knack for creating a beautiful and aesthetically pleasing design flow that is still very comfortable and livable. I am excited she agreed to share some of her inspiring ideas about how she approaches her work with us. 2. When did you realize you wanted to design beautiful interiors? It really goes back to childhood. Both my mother and grandmother were always interested in making a beautiful home so visiting shops to seek out lovely textiles or spending a day exploring antique shops were often like play days for me. My mother would let me rearrange my room and change how things were displayed to adapt to my various interests. I watched her refinish antique pieces others might have thought to be fit for the “burn pile”, only to discover a stunning curly maple grain and real wood pegs as the joinery method for boards. I’ve always been a bit of an old soul so I loved learning about things from the past. 3. How would you describe your design style? Organization is very important to me. Whether I’m working in a traditional setting or putting together a modern look, I like interiors to feel as if they offer a sense of calm because they aren’t all over the place. Even so, I still like putting together pieces which are touchstones and contain fond memories, either family pieces or pieces from a trip where one can recall who may have been on that journey, the sites, the sounds, the aromas, and so on. I’m a very tactile designer. I often follow the “rules” while also channeling my intuition about how a space should feel to its owner. 4. What inspires you? Most definitely travel! It doesn’t have to be world’s away, just a break from the everyday routine. Even a day trip to a different town or city has me in keen observation mode. It certainly helps if there is beautiful architecture or gardens to tour. Sometimes, it’s just one thing which makes my mind click and off I go thinking about how to incorporate something into a design. I should add, people inspire me, too. I often love to hear their stories as I come from a long line of story tellers. It’s in my DNA. 5. If your interior spaces had a message, what would you like them to say? Slow down, breathe, and nestle in. I think we should be nurtured by our homes. 6. What’s your favorite antique find, and where did you use it? Oh, this is such a hard one. Antiques are like children and are we really supposed to have a favorite one? Well, I think mine would be more of a collection. My red, English transferware is a pattern called Mason’s Vista and it’s kind of grown into an obsession! My husband I raced to an auction to see if I could get a few special pieces and we ended up with the whole lot. Over time, we’ve found some rare pieces and they have been tucked into some cabinets where we can enjoy them. And – we also do use them. Not only are they incorporated into table settings but I decorate with them and keep flowers in some of the containers. 7. How do you incorporate antiques and vintage pieces into your designs? It depends on how my clients perceive antiques and I do spend time educating them as to the benefits of their cost-effectiveness. For example, some new pieces of furniture, which are designed to have an antique look, will not hold their value the minute they are placed into a home. They can be of fine quality but I liken them to the new car one drives off of the lot. An antique can sometimes be purchased for less but if one invests well, the value should be the same in a resale situation. They add depth and character. I had one client who had never owned an antique because she often looked at them as “used” items. I convinced her to purchase a decorated tilt-top table to fill in a spot in her dining room. She called me, a short time later, giddy with excitement about all of the positive comments she received about that one piece. It opened up a whole new world for her. 1. My favorite colors are: Red, green and black. I’ve used them in different saturations and portions, over the years, and I never get tired of them. 2. If I could have one wish, I would wish for: Good opportunities for everyone. I believe when we all do well, we all do well. 3. Right now I’m reading: I’m a serial reader and lately I’ve been reading more business books. For fun, I’ve gone back to re-reading The Three Miss Margarets by Louise Shaffer. If you like a story where a secret is revealed, steeped in southern characters, it’s a good read while sitting on the porch swing with a breeze floating in the air. 4. My favorite place is: Anywhere there is a garden! 6. A French Garden House antique I adore: The Antique French Enamelware Canister Set with Rose Garlands and Stripes appeals to my love of gardens and my nature for keeping everything in its place. Can’t you just imagine them stretched across a marble bathroom vanity, housing everything from bath salts to cotton swabs? You can see Wanda’s work at Wanda S. Horton, read her blog, and follow her on Facebook to be inspired by her beautiful sense of style. Love Wanda’s timeless, elegant and fresh style? Design your own well-collected and personal interiors with antiques and decor from FrenchGardenHouse. 1. Antique French Bakery Scale. 2. Antique French Majolica Plate. 3. 19th Century Majolica Leaf Plate. 4. Chateau Floral Arrangement. 5. Antique French Watering Can. 6. Antique French Enamelware Cannister Set. Shop for the best in French Antiques, furniture with the patina of age, vintage accessories to delight you and your family & friends, and French Country utilitarian pieces. Treasures that make your home fresh, beautiful, inspirational and uniquely yours. Visit our shop FrenchGardenHouse.com. Thank you so much, Lidy and Wanda, for sharing this guest post. I love your design ethic, Wanda. As a southern girl, your interiors are right up my alley! Love everything I’ve seen, I’m going to go to your website and learn more about you. Great interview. I always learn new things, and see beautiful things on your blog, Lidy. Thank you for inspiring and teaching me about interior design, and antiques. 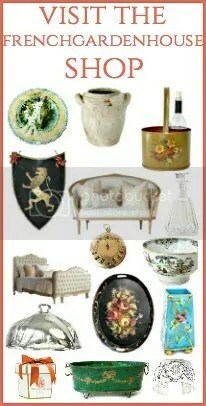 I just bought some gorgeous majolica from you, can’t wait for it to arrive. Thank you, Sandy. Your parcel is on its way, I’d love to see a photograph of how it all looks when you have it at home. What a great talent, Lidy! Thank you for the interesting interview and gorgeous photos. Wanda has such a timeless sense of style, I would love to have her visit me here in Chicago! Yes, she is a great talent, Jane! Her interiors are just beautiful, and so very livable too. It was an honor to be able to interview her. Please do go visit her website! Wanda, thank you for taking the time to share your design talent with us. It’s a treat that I am sure my readers love. Your design savvy, how you put your heart into every design challenge, the gorgeous interiors you create for your clients all speak to the talent you share with the world. Wanda has such a great style. Thank you for sharing, I am inspired. Beautiful interiors, using wonderful colors. Lovely interview with a lovely and talented lady! I agree, Linda! Thanks for stopping by and taking the time to leave a comment. This is a wonderful post! Ms. Horton is truly talented designer with a great eye! Thanks, Laura. It was an honor to have her on my blog. Thank you for a very interesting post. I admire designers like Ms. Horton, to be able to put together a pleasing, personal interior is no easy feat. Thanks for always inspiring. LOVED all the photos. Such a joy to see and read all your posts and photos Lidy. It is nice to see photos of so many things I love in my own home. Thanks for sharing Wanda with us and the beautiful work she does. Thank you, Wanda! We are delighted and honored to hear that you love your DEWOOLFSON down pillows made in North Carolina.